Fred Saunders was a fast moving NBA style player who played forward for Syracuse his senior season. He loved playing an upstyle tempo of game and could run the court with ease. Saunders originally attended the University of Southwest Louisiana for basketball, and played there for three years. However, the school was hit with NCAA violations, and Saunders sought to transfer. Saunders played 87 games at Southwest Louisiana, scoring 568 points (6.5 ppg) and 780 rebounds (9.0 rebounds per game). 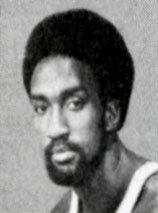 After sitting out for the first semester, Saunders was eligible to play for Syracuse in January of 1974, and he proved to be a vital part of a team that made it to the NCAA tournament. He would average nearly ten rebounds a game along with nearly ten points. He was very foul proned at Syracuse, fouling out of six of the sixteen games he played in for the Orangemen. Saunders was drafted in the 2nd round of the NBA draft by the Phoenix Suns. He would play in the NBA for four seasons, in part with the Suns, the Boston Celtics, and finally the New Orleans Jazz. He would later become a Physical Education instructor and basketball coach at Franklin Heights High School in Columbus, Ohio.